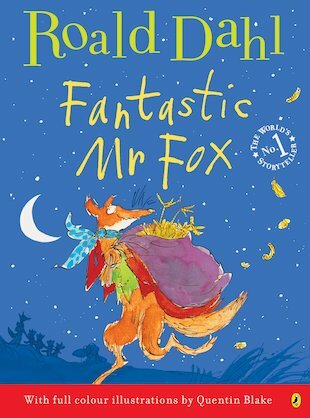 Boggis, Bunce and Bean are the meanest farmers in the world – and they hate Mr Fox! He has been stealing their chickens and cider to feed his family and the hungry animals on the hill. So when Boggis, Bunce and Bean declare war on Mr Fox, they mean business! They are determined to get him. They lie in wait outside his hole each day, crouching behind trees with shotguns and shovels. They swear that they will shoot, starve or dig him out. But Mr Fox is a crafty, noble fox with lots of little foxlets to feed, and he isn’t going to give up that easily… Marvel as cunning, clever Mr Fox strikes back against the nastiest farmers in the valley in this fantastic edition of Roald Dahl’s classic, where Quentin Blake’s incredible artwork is transformed into dazzling full colour! This is a great story,,,,! This story of how a fox sneaks food from farms and gets away with it is truly unforgetable! I loved it so much it was super funny & sneaky silly farmer hahaha!! !